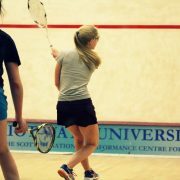 Squash was invented in Harrow school around 1830, when the pupils discovered that a punctured Raquets ball, which “squashed” on impact with the wall, produced a game with a greater variety of shots and required much more effort on the part of the players, who could not simply wait for the ball to bounce back to them as with Raquets. The variant proved popular and in 1864 the first four Squash courts were constructed at the school and Squash was officially founded as a sport in its own right. In those early days Squash, as with all other sports, was without any form of international standardisation and it was inevitable that slight variations in the way it was played, and the equipment used, would occur. Luckily only two main streams of activity followed, one in England with its 21 feet wide courts and “soft” ball and the other in North America, with its 18.5 feet wide courts and “hard” ball and with both courts having the same length of 32 feet the universality of Squash was not seriously challenged. We will look at these two branches separately and also at the way in which Squash spread to almost every nation in the world. While major growth in the game of squash took place in the 1970’s and 80’s, along with the professionalism of the 90’s, it is interesting to think back to those far-seeing few in the 1930’s who felt that it was a game for the future and would therefore need a structure to develop on. One of these was Mr J.C. Allan who was instrumental in founding Watsonians Squash Club in 1934. The following are some notes based on his personal reminiscences about how Scottish Squash Raquets Association came into being. Watsonians found few organised clubs to play against in 1935, there were courts at Edinburgh Academy, Fettes College, Glasgow, Aberdeen and Brechin, plus one or two local private ones in Edinburgh, although quite a lot of other private courts, mostly now out of existence, were scattered around the country. On February 15 1936, Mr T.J. Carlyle Gifford, who had his own court at Belford, sent out a circular letter inviting all interested parties to attend a meeting in the Watsonians pavilion at Myreside on February 28, where the proposal was agreed that a Scottish Squash Raquets Association be formed. A steering committee of John Dunlop, a Chartered Accountant from Glasgow, Alex Gray, a lawyer from Aberdeen and Mr Allan (Secretary) drew up a draft constitution, which was approved at a meeting of squash raquets representatives on the October 2 1936, attended by 13 people. The first president was Mr T.J. Carlyle Gifford and the secretary, Mr R.J. Henderson also of Edinburgh. The subscription was 10/- per court, though even then a strong argument was put in favour of a ‘per capita’ scheme. The Auditors were Messrs Chiene & Tait. In the first year there were six club members (Edinburgh Sports Club, Watsonians, SSRC, RAF Turnhouse, Edinburgh Academy, Aberdeen SRC and four individual members growing to approximately 38 clubs and 16 individuals when the amalgamation took place between the SSRA and the Scottish Women’s Squash Raquets Association (which was founded in October 1937 with E.E Knox as president and Miss S. Millar as secretary). Even before the formal founding of the association the first Scottish Men’s Championship was held. The self-appointed Championship Committee was Sir Stewart Stewart-Clark and his brother, J.C., Mr Carlyle Gifford, Messrs D.S. Carson, R.Lyle, R.J. Henderson, Captain E.D. Stevenson and Mr Allan himself as secretary and treasurer. He also in his own words, remained a selector for a number of years because he ‘was about the only official who couldn’t possibly pick himself!’ There were 20 entrants to the first championships with the preliminary sections of the tournament being played in Edinburgh and Glasgow, with the semi-finals and final being played at Myreside on February 28 and March 2, 1936. The winner was Ian Crabbie who beat Sir Stewart Stewart-Clark 3-2 in a match watched by 45 spectators. In the following year the finals were held at the newly opened Edinburgh Sports Club, where the championships remained until the early 1980’s. The first ladies’ championship was won by Miss E.E. Knox in December 1937. The ladies also have a unique doubles championships played on the only doubles court, at that time, in the country at the Edinburgh Sports Club. Take a look back and celebrate those who’ve previously represented Scotland by visiting our Historical Player Caps page.